When it comes to healthy food for my family, fresh is best. For quick & healthy recipe ideas, you can’t get much easier than meals with fresh, local, high-quality eggs. Whether you like your eggs poached, fried, scrambled or as an ingredient in your favourite family recipe, you can rest easy knowing that each egg provides 14 essential nutrients. There are so many reasons to be #Thankful4Eggs! We’re celebrating eggs this month with an egg-citing giveaway and Twitter party! You’ll find the giveaway entry form and Twitter Party RSVP link below. Eggs are the one food you will always find in our fridge. From healthy breakfast ideas to delicious cakes, we go through a lot of eggs around here! 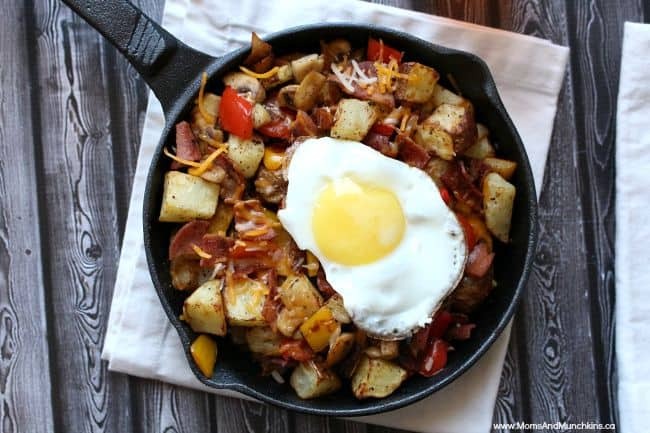 This Skillet Breakfast recipe wouldn’t be complete without a fried egg on top! For this recipe, I start by making fresh chunky hashbrowns in my ActiFry. Don’t have an ActiFry? No problem! Another tasty way to make this recipe is with leftover baked potatoes. Simply slice those leftover potatoes and fry them with a little butter and pepper. Put the potatoes aside until your bacon and other vegetables are cooked. You can make your own homemade hashbrowns (I make mine in the ActiFry) for this recipe. In a skillet, cook your bacon. Once cooked, chop it into bite-sized pieces and set it aside. Slice up some fresh vegetables like bell peppers, onions and mushrooms. With a little butter or vegetable oil, fry them (in that same frying pan) until they soften slightly but are still crunchy. 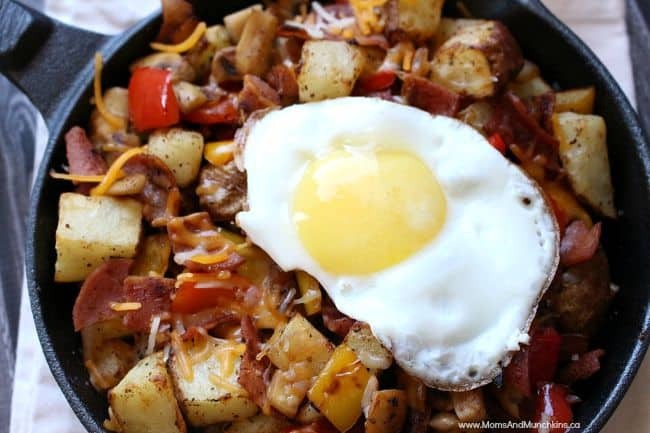 Put the hashbrowns, vegetables and bacon all in the skillet and stir to mix. Sprinkle on some shredded cheese. In a separate frying pan, cook eggs over easy (one egg per serving). Place one fried egg over top of each serving. Looking for more delicious recipes with eggs? 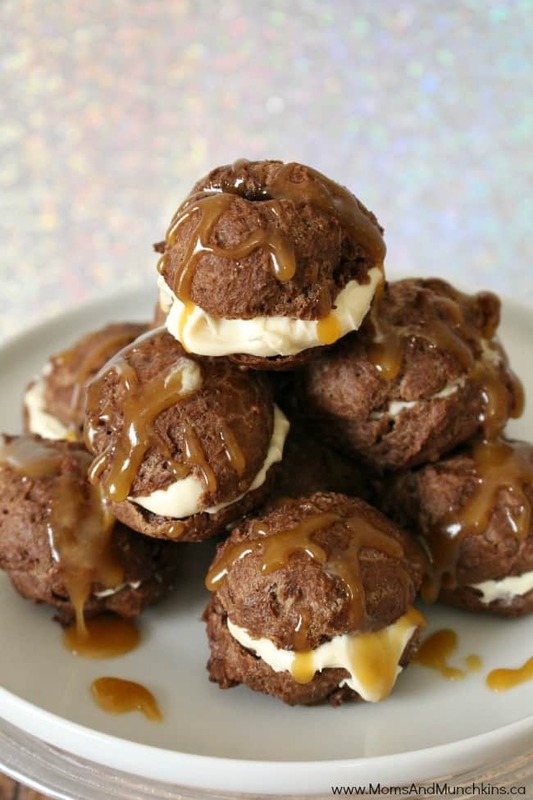 Your family is sure to love this Kentucky Scramble and these Chocolate Caramel Cream Puffs are a crowd-pleaser! I am thankful for eggs because it is one food that the entire family will eat without complaining – eggs are a staple in our house and we have them several times a week. I am thankful for eggs because they are full of protein and tasty. They are great for breakfast and for baking. We go thru eggs regularly and are thankful to have them. I’m thankful for eggs because my daughter LOVES them and they are a healthy source of protein for her! I am thankful for eggs because they make my life easier. The whole family loves eggs. Knowing they are nutritious for them is a bonus. How easy they are to make in any style is amazing. Currently I am dieting so i am eating egg whites in bulk 🙂 With hot sauce is my favorite. I look forward to the twitter party. I am thankful for eggs because they are yummy! My youngest doesn’t like meat and eggs are the only way to get protein in him because he loves eggs all ways! I’m thankful for eggs because they have so many uses. They can be eaten on their own or in dishes like omelettes and used for baking. I always have them in my fridge. Right now I am thankful for eggs because they are the only thing Sophie will eat since she had the stomach bug a few days ago. I’m thankful for eggs because it provides a healthy energetic breakfast for our family every day! 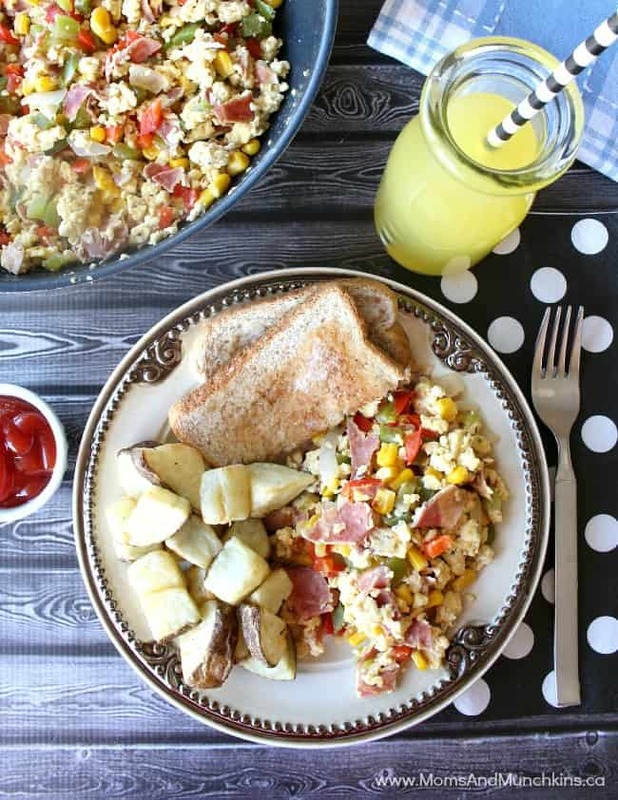 I`m thankful for eggs because they make some of the easiest meals – egg salad sandwich, omelets, etc. and my husband loves to cook with eggs which is very helpful! I am thankful for eggs,because they are a delicious convenient source of protein! I’m thankful for eggs cause they are my regular breakfast food! I’m thankful for eggs because they are delicious protein packed versatile food. I’m thankful…eggs are a simple, fast breakfast or even a snack. I am thankful for eggs because they are a staple in cooking . They are delicious and nutritious and essential when baking. Eggs make Saturday morning breakfast special. I love fried egg with cheese on an english muffin. Bacon and eggs is fabulous too! They are always part of our holiday breakfasts as well! Eggs make the perfect breakfast. They’re packed with nutrients, they’re healthy and you can use them in so many ways. I am most thankful for eggs because they are a good source of protein and provide nutrients to our family. A breakfast staple in our home is always eggs. I am so thankful for eggs because of all the amazing different recipes you can create with them. They are convenient, fast, and wonderfully tasty! I don’t know anyone who doesn’t like eggs. I have an egg as a snack in the late evening. It’s my protein with low calories and satisfies my hunger. I have eggs everyday for the extra protein. I am thankful for eggs because they are nutritious and healthy and they can be used in so many ways for breakfast lunch or dinner options. I am thankful for eggs because my two sons are allergic to wheat and dairy products! They can’t have a lot of breakfast foods when we go to restaurants and even at home but they can eat eggs! I’m thankful for eggs because they are so versatile. You need them for baking and they make a nutritious meal. I am thankful for eggs because I can use leftovers for the filing and make an omelet. I am thankful for eggs because they can be turned into a delicious meal easily and quickly. I am thankful for eggs as the basis for Egg Creations–a low-calorie but flavourful healthy protein choice! because they are the easiest food to serve my kids in a pinch! I’m thankful for eggs because they are so versatile! I love that I can get quality protein in so many delicious ways using eggs. I’m thankful for eggs because they are full of protein, goes well with everything, and even by itself! Easy to make as well. I love eggs. Because they fill me up in the mornings without causing me to pack on calories…I practically live on boiled eggs right now. I am thankful for eggs because they taste great, provide lots of protein and are so versatile. I am thankful for eggs because they have been a huge part of an affordable and healthy diet in my success in losing almost 40 lbs in the past few months – the healthy way! I am thankful for eggs because they are so versatile, delicious, great source of protein, and my kids love them. I’m thankful for eggs because they nourish my boys tummies. They love scrambled eggs! During a time when I was a child and my parents struggled to make ends meet… Eggs were the one source of food that were protein/nutrient rich and also cheap/affordable; we could make them go a long way, so versatile. I am thankful for eggs because it is a healthy breakfast for my family and so versatile! I’m thankful for eggs because I can serve them at any meal and they are always delicious and nutritious. I’m thankful for eggs because they provide the daily energy we need every morning. I can’t think of a sandwich without one. Im thankful for eggs because they are so delicious and versatile! I’m thankful for eggs, without them I couldn’t make amazing baked creations! I love eggs because all great baked goods have eggs – YUM!!! I am thankful for eggs because we use them almost every day and they just help bring dishes together. I’m thankful for eggs because i love them for breakfast! I am thankful for eggs because they are so nutritious and so versatile. I’m thankful for eggs because there are so many good and nutritious foods you can make with them! Eggs are so versatile.I can make them for breakfast lunch or dinner and use in hundreds of recipies! I am thankful for eggs because they are a quick and delicious way to enjoy protein! I am thankful for eggs because they are so full of protein. I love eggs because they are full of nutrition, are delicious, and I couldn’t make so many dishes without them! I love eggs because they start my day right! I am thankful for eggs because they are soooo tasty … especially fried sunny side up! Because they are a great source of protein! I am thankful for eggs because I really love having eggs and bacon for lunch on Sundays. I am thankful for eggs because you can make a lot of different dishes with them, and they are delicious on their own while being a good source for protein. I’m thankful for eggs because they are NUTRITIOUS and QUICK to cook. My toddler loves them and spinach omelettes make a great ‘go-to’ lunch for him to take to daycare when we are in a rush. I am thankful for eggs because they are delicious, as well as healthy! Im thankful for eggs because they are delicious and theres many different uses for them. I pretty much use eggs every time I bake something. I am thankful for eggs so I can enjoy my breakfast and for all the baking I do. They can be used in so many recipes, eaten by themselves, tastes great and are good for you! I’m thankful for eggs because they give me peace of mind for my two picky ovo-lacto vegetarian kids. Perfect nutrition! I am thankful for eggs cause it is a family favorite! Good for you and you can do so many different things with eggs that my kids love! I’m thankful for eggs because they are healthy, can be prepared several ways, and they aren’t expensive and there has never been a time that I haven’t been able to purchase them! I am thankful for eggs cause without them i do not think cakes would be as tasty. I think potato salad and egg salad would be impossible. Many many foods would not be the same without these round objects with golden centers. It brings life to the earth and taste to your food. I am thankful for eggs because they are delicious and healthy and can be prepared in so many delightful ways. Eggs are fantastic. They are affordable, a great source of protein and are very versatile! Eggs are so healthy & filling but also super versatile and delicious- and you can do so much with them in such a short amount of time! All 3 of my kids like eggs!!! I am thank for eggs because it bind all the bake goods happiness. I am thankful for eggs because they are a quick and easy protein. I am thankful for eggs because they are an inexpensive, tasty, healthy way to add protein to your diet and they are easy to use. I’m thankful for eggs since they are always so quick & easy to make in a hurry. I am thankful for eggs because they are a delicious, healthy source of protein and so easy to prepare in so many ways. 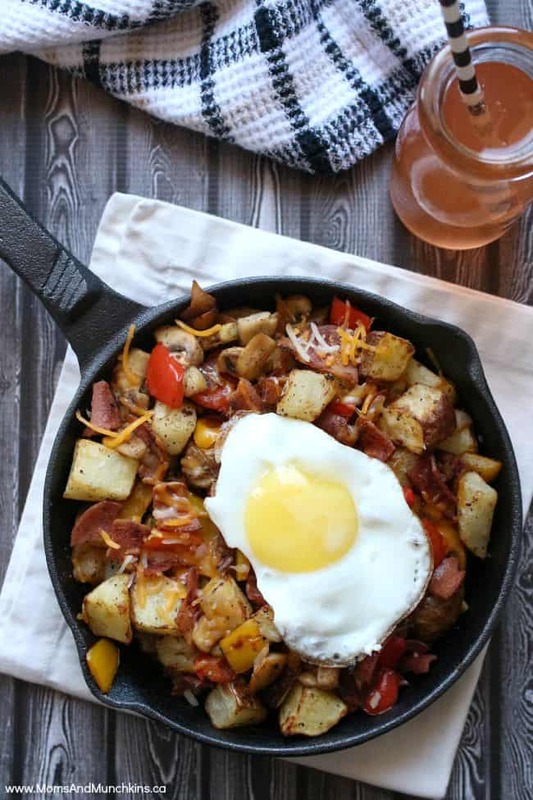 We love going out for breakfast rather than dinner, however this recipe would even convince me to stay home and make it. It looks great and I love the addition of the eggs. Thanks for sharing with us at #AnythingGoes.